Online conversion rate is the KPI (key performance indicator) par excellence in eCommerce and is expected to show an annual growth rate of 10.7% from 2017 to 2021 in Ireland. However, 44% of users go directly to Amazon to search for products and 70% of Irish spend goes overseas. For this reason, when a user visits your eCommerce site you can’t afford missing out opportunities, your eCommerce site needs to be ready to welcome the user. If you are one of the few Irish companies trading online, you might be interested in the next 6 small changes that can make you increase your eCommerce online conversion rate. It is impressive to see that still a huge amount of eCommerce sites do not have reviews. If you have to decide between two products that you like and one has reviews and the other none, which one will you choose? Having reviews will allow you to win the trust of your users and will increase the online conversion rate. Wyldsson, is a great example of an excellent use of reviews. Wyldsson is an Irish company that create healthy snacks. They promote reviews on Review.co.uk and then they embed it on their own site. With such a good reviews you feel instantly tempted to try their high quality products. 29% of users abandon at the checkout point if they need to create a new user account. So if you still have the checkout registration on your eCommerce site, you’re losing sales. Furthermore, allowing users to continue shopping once they have added a product to the chart will increase your ROI as well. As we can see Arnotts, doesn’t want to lose any sale and allows you to buy without the need of creating any new account. All those companies know how to increase their online conversion rate. As we are living in a world of immediacy, 50% of users want to be able to pay premium for a faster service in case they need it. Wyldsson.com, includes a “Free Delivery” claim, even if it is for orders over €49. Dunnes offers, “Click and Collect”, making easier and faster buying from them, as you can buy at home and just pick up the packet on your way home. Include shipping charges on the price of the product. It depends where do you ship, if it is a close area and you know that the shipping cost are not so high, you can always include them on the price and offer free shipping. This way simplifies the process and create a higher incentive to buy. When buying online we are still missing the physical contact with the product, for this reason, we need to find the way to give the users as much information as we can. The zoom in allow users to see the details that otherwise are not visible. Studies show that 70% of eCommerce site users rank the ability to zoom in on product images as one of the top priority for deciding on purchase. In general improving the usability of your eCommerce site will help you increase your online conversion rate. For example ASOS, is not only allowing zoom in also shows the product on movement with their videos. Littlewoodsireland.ie is also a good example of zoom in implementation. Up-selling is the fact of offering upgraded versions of the product. An example can be Ryanair, offering you being first on board or choosing your seat for few more Euros. Cross selling offers related products as the example below from Amazon. Studies reveal that product recommendations like upsells and cross-sells are responsible for an average of 10-30% of eCommerce revenues. Which means they are techniques that you should be applying to your ecommerce website in order to increase your online conversion rate. Elverys.ie, use cross selling as always offers you other products that you might like. Consumers need to be secure that they are giving their personal information to a secure site. For this reason it is a must to have a SSL Certificate. SSL creates an encrypted link between the web server and web browser, allowing sensitive information to be transmitted securely. Apart of the SSL Certificate, a Trust Seal on the check-out page will increase the feeling of security on your eCommerce site. The most trusted seals when paying online are Visa, Mastercard, PayPal, Norton and Google. Wyldsson.com, enhances their trust by adding the Trust Seal on their footer, so the users can immediately associate them with security. Littlewoodsireland.ie reminds you that you are buying secure, with their “Continue Securely” button. Make your users feel secure to increase your online conversion rate. By making your number one priority “the satisfaction of the users that visit your eCommerce site” you will increase your online conversion rate. Amazon is the number one eCommerce choice and follows this principle. Ensure that your customers won’t have any security issue on your site. Ready to begin? 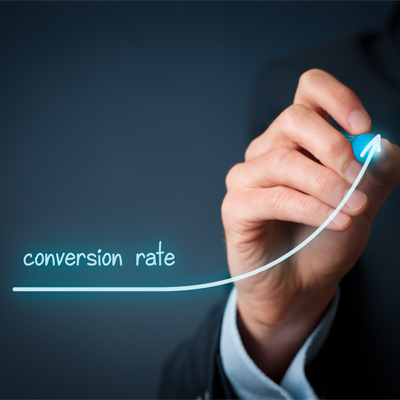 Let us know if you need help increasing your online conversion rate.